3. Who does this Procedure Apply to? By working in partnership these groups can assist early identification if providers are at risk of falling standards, that might lead to wider concerns and the need for safeguarding intervention. There is a clear responsibility on commissioners and providers to ensure safe, quality services that will reduce the need for safeguarding interventions. This section is relevant to all providers not just those in the CQC inspection regime. The CQC are responsible for inspecting and monitoring providers registered under the Health and Social Care Act 2008. It has statutory powers to inspect how well services are performing against the CQC’s Fundamental Standards of quality and safety, and can take proportionate enforcement action to ensure providers improve where there is poor care. This section explores work with providers as a means for responding to potential business failure (contracts and commissioning responsibilities) and details how allegations of organisational abuse are managed where safeguarding concerns are identified as serious matters within an organisation as opposed to single concerns that may be addressed under Section 42 enquiry (see Stage 2: Enquiry). Safeguarding concerns in this sense relate to patterns of reported abuse or neglect, about one provider, or where a single concern indicates a serious matter that warrants closer inspection under adult safeguarding processes. In some instances, safeguarding action may be initiated following a Safeguarding Adult Review (see Safeguarding Adult Reviews), or run in parallel to one. The focus of this section is on prevention, in particular actions that might be taken in response to concerns about quality issues, to reduce the risk of escalation to safety and safeguarding issues. Finally, this section aims to ensure that people have a voice in influencing how services are delivered and where there are concerns, and how their views and experiences lay at the heart of improvements. 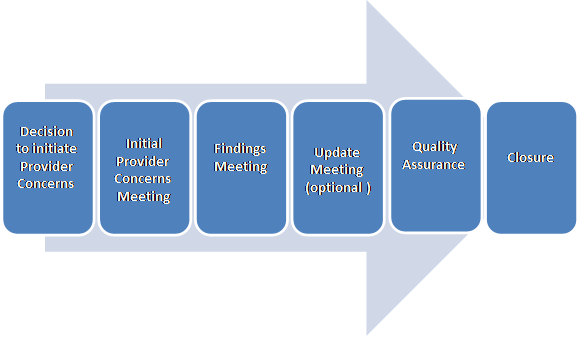 The working with providers procedures section follows a six step process. The procedure applies to all care and support provision, whether or not it is directly commissioned by a local authority, clinical commissioning group (CCG) or NHS England and irrespective of whether or not it is included in the CQC Market Oversight Regime. Services managed by the local authority or NHS are subject to the same level of scrutiny as independent care providers. This guidance should be considered in parallel to Risk Summits Within the NHS, the National Quality Board has published Risk Summit National Guidance. The risk summit process can be implemented if any part of the local, regional or national system has concerns that there may be serious quality failures within a provider organisation and which cannot be addressed through established and routine operational systems. This includes where there are significant safeguarding breaches and breakdown in systems which compromise the safety of individual with care and support needs. The Risk Summit can be an effective and non-prejudicial method for facilitating the rapid sharing of information and intelligence across different organisations, and for initiating remedial actions where it is required to safeguard or improve quality. 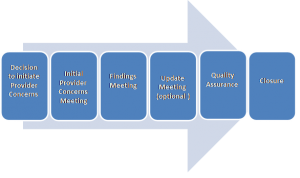 Risk Summits can both inform and be informed by quality concerns raised by Quality of Care Information Sharing Meetings. Where a Risk Summit notes safeguarding concerns these should be managed through local adult safeguarding arrangements. Quality Surveillance Groups bring together different parts of health and care economies locally to routinely share information and intelligence to safeguard the quality of care individuals receive (see Appendix 4 Safeguarding Adults Structures and Organisations for further information). A shared goal between all parties is that adults can expect to receive a safe, quality service. Integral to the effectiveness of partnerships is the need to work in a transparent and open way. It is not the intention for this policy and procedures to be punitive in its dealings with providers but to implement quality and safeguarding principles by supporting and giving a helpful steer when concerns arise, to assist providers in getting back on track. Open dialogue can only be achieved where there is trust and a willingness on all parties to work together. The rules of natural justice should be observed, and where there are organisational concerns enquiries or investigations should be based on evidence and a thorough assessment. Providers should underpin their own policies and procedures under the six safeguarding principles (see Principles, Section 1, Principles of Adult Safeguarding). They should empower adults to fully participate in how services are run by creating a culture of dignity and respect. Providers are accountable to adults using their services and commissioners, for meeting the expected standard of care agreed in individual care plans, contracts and commissions. They are expected to have a robust quality assurance framework in place that evidences commitment to prevention and early intervention. Such commitments are about recognising potential abuse and learning from past situations to inform better practice. Undertaking regular staff training, supervision and appraisals, self-audits and making changes as a result, reduces the risk of matters escalating to safeguarding action. Providers should publish an open and transparent complaint procedure with the assurance of no retribution; and offer ways of gaining customer feedback supports empowerment and quality assurance. Independent advocacy and regular service user/carer/patient led meetings are equally important to ensuring that services are influenced by adults who use them. Providing Good Care (Local Government Association) gives guidance for providers to audit the quality and safety of their services. Providers have a duty of care to protect adults and meet safeguarding standards; this can be evidenced where there is a clear commitment to protection in their policy and procedures that is observed in practice. Action taken in response to safeguarding should always be proportionate with the least intrusive response that will effectively manage risk. In turn commissioning organisations should offer support and guidance where it is asked for or identified through constructive dialogue. Provider forums are a constructive mechanism for sharing best practice, and identifying areas of risk, transparency and information sharing. Where providers support adults in or from a number of different establishments within the same locality, care should be taken that one establishment is not seen in isolation. This is to ensure that any failings are not endemic and embedded in corporate cultures and systems. This may impact on the capacity and capability of the provider to implement agreed improvements, but ensures that improvements are made on firm, sustainable foundations. The Report of the Mid Staffordshire NHS Foundation Trust Public Inquiry (also known as the Francis Report) recommended the development of a culture of openness, transparency and candour in all organisations providing care and support. NHS providers are required to comply with the duty of candour. Meaning providers must be open and transparent with service users about their care and treatment, including when it goes wrong. The duty is part of the Fundamental Standard requirements for all providers. It applies to all NHS trusts, foundation trusts, special health authorities and all other service providers or registered managers. The principles of natural justice concern procedural fairness and ensure a fair decision is reached by objective decision making. Where there are concerns about quality or safety these should be evidenced, and parties provided with information and opportunity to take action to address concerns. Each organisation will have its own whistleblowing policy and provide staff with protection from victimisation or detriment when genuine concerns have been raised about malpractice. See Stage 2: Enquiry, Section 3, Criminal Investigations. In the event that staff are suspended, adult safeguarding processes should consider how it can dovetail any agreed disciplinary processes. It should be borne in mind that a provider concerns process may feed into human resource processes, but this provider concerns process in itself cannot determine outcomes for staff under employment laws. People, who arrange their own care and support, may not be known to either the local authority or its partners. In order to safeguard them and meet the duty of care to offer protection to all people who are in need of care and support, and unable to protect themselves (the majority of people living in a care setting), providers are required to work with the local authority andpartners, to ensure that information and advice is readily available, and that information is shared when requested. Where the person alleged to cause harm is also an adult who is experiencing or at risk of abuse or neglect, the safety and wellbeing of both the individual subject to possible abuse, and the person alleged to have caused harm needs to be addressed separately. In most cases, this can be considered through the Section 42 enquiries as appropriate. The least intrusive action should be taken to support adults using the service. The provider is responsible for ensuring that actions are taken that support the person alleged to have caused harm in consultation and collaboration with commissioners, and the safety and wellbeing of other adults using the service. Commissioners are responsible for ensuring that the service meets the assessed needs of adults and that regular reviews are carried out to ensure this. foster a workforce whose members are able to ensure the delivery of high quality services. Quality services are those that place the health and welfare of people who use services as paramount and deliver positive outcomes. These are evidenced in the characteristics of the service through policy, procedures, standards, and structures for overseeing and maintaining service delivery to the requirements set by the regulator (CQC) and / or by robust contract monitoring. In some instances, the local authority may not contract with a provider; neither may the provider be subject to the CQC inspection regime. Providers, who fall under this category, will still need to maintain health and safety standards and where it delivers care and support through regulated activity, it should still have quality and safeguarding measures in place. See Regulated Activities (CQC). ensure that all documents such as service specifications, invitations to tender, service contracts and service level agreements adhere to safeguarding principles and standards. promote a sustainable and diverse market place. Excellence (see NICE Guidance) offers health and social care providers guidance on standards. Additionally the Safeguarding Adults: The Role of NHS Commissioners provides helpful advice for NHS commissioners to identify quality services. Local authorities should have knowledge of market vulnerabilities in order to respond effectively (see Factsheet 1: General responsibilities of local authorities: prevention, information and advice, and shaping the market of care and support services). Where there is a danger of a provider going into liquidation, commissioners should be informed so adequate safeguards can be put in place for adults currently using the service. Periodic market analysis (market shaping) to assess capacity and viability of services is helpful to ensure that in the event that additional resources might be needed local needs can be met. The CQC is responsible for market oversight of adult social care in England. This is a statutory scheme through which the CQC assesses the financial sustainability of those care organisations that local authorities would find difficult to replace (due to their size, specialism or concentration in the market) should they fail and become unable to carry on delivering a service. The CQC must give local authorities an early warning of likely failure affecting adults receiving care in their areas, so that local authorities can make contingency plans to enable them to meet their statutory duty to ensure continuity of care. Most service interruptions are relatively small scale and low risk and are therefore easily managed, but those on a larger scale have much greater potential impact. A key learning point from major commercial failures in recent years was that few local authorities could respond effectively without working with their partners, including other providers. Where the continued provision of care and support to those receiving services is at major risk and there is no likelihood of returning to a ‘business as usual’ situation in the immediate future, adults may have urgent needs which must be met, including safeguarding. Contingency planning sits alongside other emergency planning activities. Not all situations where a service has been interrupted or closed will warrant local authority / CCG involvement because not all cases will have the same risks associated with safeguarding. For example, if a care home closes and residents have agreed to the provider’s plans to move to a nearby care home that the provider also owns, the level of risk or the need to invoke safeguarding will be lessened. The aim is to return to business as usual, wherever possible, and with the least disruption to adults who use the service.